Edom Hills is a gale of a distance from Watchfield, but these two places are positive, and unlikely, case studies of how things might be in the wide open spaces of energy hungry nations. Edom sits at the head of the San Gorgonio Pass, close to Palm Springs in California. The blades of eight Clipper WindPower 2.5 MW turbines spin vigorously in the almost constant breeze that blows up from the Pacific Coast. Their generating capacity is 20 MW, providing enough free energy to power 10,000 houses (1 MW supplies about 500 “average” houses). Westmill Wind Farm at Watchfield is in Oxfordshire in the UK. It opened in 2008, five 49 metre high towers marching in a straight line across an old airfield, producing Co2-free electricity for 2,500 homes. Neither wind farm is particularly remarkable in itself. The USA is now enthusiastically embracing wind energy. ”It’s one of the most important and promising wind energy markets in the world,” according to Paulo Fernando Soares, CEO of turbine maker Kenersys. 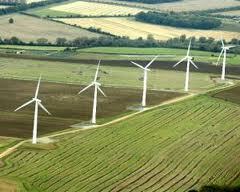 Turbines are springing up in the UK too, although at a slower rate, with some of the very biggest out to sea. What is more remarkable is who is operating the two renewables sites. Edom Hills is run by current US energy bête noire BP, whose leaking Deepwater Horizon oil well caused one of the biggest marine ecological disasters in the nation’s history in 2010. And Westmill is run by the very people you might expect to take strongly against big, muscular and very visible spinning blades in the countryside, the local community. In a sense BP’s Edom Hills Wind Farm should surprise us less. It is the latest addition to an already well-established wind facility in the San Gorgonio Pass. Turbines have turned here since the 1980s. Currently 3,218 units of various vintages deliver 615 MW – BP’s are some of the newest turbines, and most efficient. The Oxfordshire farm is much more of a surprise, set against a growing clamour of opposition to wind turbines in the UK countryside. But here locals did not default to NIMBY (not in my back yard) mode and pile on the standard objections, such as size, perceived impact on wildlife and habitat and “noise shadow flicker”. Not only did they approve the facility, which opened in 2008, they actually own it. Westmill Wind Farm is the first 100% community owned scheme in the UK, Funding for the £7.6m project came from a public share issue, taken up by 2,374 people, who are now members of the Westmill Co-op, and a loan from the Co-op bank. It’s an unlikely contest, the USA vying with the UK to see who is the most committed to wind. Currently the USA seems to be edging it, and it’s an irony that BP prefers to develop the 100 % green side of its business in the very nation where it is so reviled, and where a significant number of people still deny clmate change. BP Wind Energy (BPWE), a separate division of the company, currently operates ten wind farms in seven U.S. states. Although its budget and turnover is dwarfed by BP’s oil and gas production, its impact is significant in its own sector. Since 2005 BPWE has built its American wind power business from zero to a generating capacity of over 1,300 megawatts (MW), with a further 1000 MW in an advanced stage of development. BP focuses its wind portfolio in the U.S. because the climate and public policy favour wind technology. In 2009, wind power provided 39% of all new power generating capacity installed in the U.S. and is projected to account for as much as 20% of all the country’s power supply by 2020. The company’s latest project is the Trinity Hills wind farm, in Archer and Young counties, Texas. 90 Clipper Windpower C-96 wind turbines will generate 225 MW, enough for a medium sized city. Trinity Hills is scheduled to be in commercial operation in the first quarter of 2012. In the UK, the nominal home of the multinational BP, proposed onshore wind farms are still routinely opposed by local communities. In 2010 there was a 38% drop in onshore installations, 503 MW compared with 815 MW in 2009; at the same time there was a 230% increase in offshore installations, 653 MW, compared with 285 MW in 2009. There are times when the proposed turbines are in the wrong place. However that frequently negative response to onshore wind may have to change, with the UK government’s recent commitment to halve Co2 emissions by 2027. Previous PostSan Francisco to ban Yellow Pages and save $1 million	Next PostIs this the car for whatever green mood you are in?